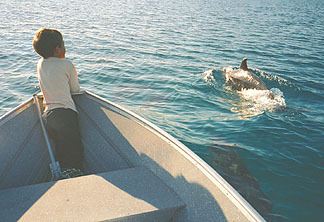 Most Baja lovers consider it to be more than just a peninsula. I start to feel Baja soon after entering the desert south of El Rosario. There is a wonderful section of desert down there that resembles our Joshua National Monument. Alex always bugs me to stop here to stretch our legs. We took a few hours this year to hike a canyon: I followed the dry riverbed below and Alex would periodically hail from above, perched on some rock. Noting the desolation of the area I remarked to Alex that he was about the right size for a hungry mountain lion. He just rolled his eyes. Yes, I thought to myself, he has changed since our last visit to Baja only a year ago. When we arrived at Puerto Escondido in early October the countryside was a lush green color. Three weeks of chubascos had transformed the desert. It was hot and humid and, at night, we were molested by swarms of bugs that the locals called 'nene'. 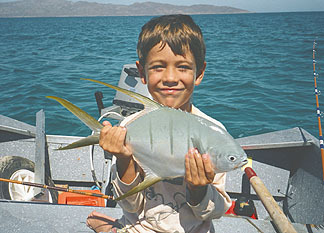 The Sea of Cortez, however, was a flat beautiful blue and loaded with baitfish. The evening bite would start with periodic baitfish eruptions by the old pier. As the evening progressed the baitfish seemed to be everywhere. Groups of pelicans dived from area to area and we followed them into the black horizon. Alex and I caught sierra and skippies until our arms felt like lead. It felt good to cut loose after 4 days of driving. Eventually Alex hooked his first dorado on a Zebco reel that wasn't up to the task. 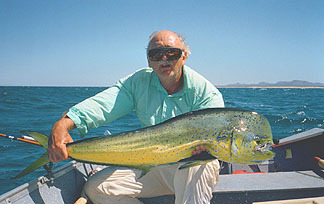 We grew very excited at the sight of the fish near the boat because there was no indication of dorado in the area. When I tried to net the fish it just took off. There was a scream from the reel and then a gunshot as Alex stumbled backwards. His face wore an expression of disbelief and bewielderment. One morning we encountered a school of porpoises off the south end of Carmen. I wanted to show Alex how an experience with wild dolphins compares to Marine World. I directed him to sit on the bow of the boat and I gunned it into their midst. We had leaping dolphins close enough to reach out and touch. They were directly below him and he was shouting back to me above the din of the motor that they were squealing to him in dolphin-talk. I wondered if they were expressing their excitement to him. During these chase games I could feel their powerful strokes beneath the boat causing the motor to shake in my hands from the turbulence they created. The heat and bugs eventually drove us out of Loreto and we headed for the welcome breezes of La Ventana. The baitfish and large gamefish normally abundant in October were scarce this year and we had to be resourceful. We bought fresh squid in La Paz, which were cut into one inch squares, and used for chum near the Pt. Arena lighthouse. The polaroid sunglasses revealed pompano, jack crevalle, and baby roosters over the sandy bottom below. We had nonstop action on light tackle for as long as we cared to fish. The guided flyfishermen from La Paz that showed up abandoned their pursuit of larger fish and joined our chum line. Alex really wanted to catch a tuna this year but they simply weren't there. 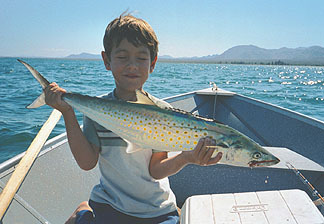 Instead, I concentrated on the few dorado and we enjoyed some measure of success (one or two per day). The bite usually occurred in the afternoon after the wind came up. We hooked the largest fish right in front of the campground with the wind blowing twenty knots. Alex was rolled up and sleeping in the bow when the fish struck. I shouted "dorado" and Alex opened his eyes to see the mighty fish greyhounding into the distance. After an aerial display, he took out line and would not relinquish. He felt like a sea anchor out there as the wind blew us to shore. I worked him hard for I knew that soon we would be in shallow water and I would have to cut the line and start the motor. 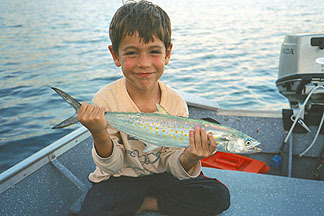 Boatside, Alex gasped at the size of the dorado. He was too large for the salmon net and I eventually had to tail him to get him in. We were both exhausted and I spent a great deal of time reviving him before he swam off. By the time we returned to Pt. Escondido the weather had cooled and the bugs were gone. The sierras were still there but no longer a novelty. A massive school of sardines had parked itself beneath the pier and I decided this would be a good place to dive. Alex still doesn't know how to swim but I encouraged him to try it with fins and it worked (as it had for me some forty years earlier). What we saw was amazing. We were enveloped by a silver wall of baitfish shimmering like precious stones. When we dove below them and we encountered the large cabrillas, golden groupers, and snapper silently gliding away. We could work our way down the pilings and admire the assortment of colorful clinging starfish. I kept a blue one that had bright red, quartz-like bumps on its back. In the end, I had to admit that the dive was well worth the price of the Seiko watch I had ruined by submerging it (It was supposed to be waterproof!). Onward to San Lucas Cove! "The dorado are a little scarce," we were told, "but the sierras are as thick as fleas at the entrance." Indeed they were. I started losing rapalas in no time. The literature will tell you to use black swivels on your leaders to prevent fish from cutting your line with their teeth. NOT! They were targeting the dark swivels equally well. I finally uncovered a stash of flexible wire leader in the bottom of the tackle box and tied it directly to the fishing line. By then I was down to my last two jointed rebels which I fished until the paint was gone and their back halves were torn off. Ahhhhh, but what fishing! We caught a couple of sierras in the ten pound range that screamed line off the spinning reel as well as any self-respecting tuna. Alex has vowed to catch a wahoo next year. The days passed quickly and soon it was time to start the long drive home. The landscape around Tres Virgenes is particularly beautiful and we decided to explore it a bit. Alex and I pursued our own interests and soon became separated. I was photographing an elephant tree by the side of a dirt road when I first heard Alex shouting. Shortly thereafter he appeared around the bend runningundefinedwith a bull trotting behind. I became alarmed at first but soon realized the animal posed no real danger. However, it wasn't until we came home and I examined it's picture more closely that I realized of the animal's true intentions; they were amorous. I had often wondered how cattle survived in such a harsh environment. This individual showed that. 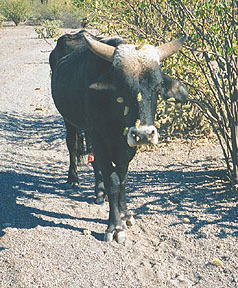 The poor creature's head was covered with detached cholla cacti that he had no way of removing to relieve the pain. Another Baja memory. Alex is six now and into monsters. We often ended our evenings at the campground with stories about the big three( Frankenstein, Wolfman, and Dracula). Alex concluded that Dracula was to be feared the most. His favorite, however, proved to be the Wolfman, a sort of schizophrenic, reluctant monster who didn't want to scare you, but had no choice in the matter. I casually reminded Alex that night about the full moon that we were going to have.